For the peanut sauce, heat the oil over a medium heat in a small pot. Cook the garlic and chilli for 1 minute, or until fragrant. Add in the KEEN’s Curry Powder and continue to cook for 1 minute. Add in the peanut butter, kecap manis, tamarind and coconut milk. Stir well to combine. Bring up to a very gentle simmer and leave to reduce 3-4 minutes, stirring occasionally. Heat the sunflower oil in a medium sized pan over a medium heat. When the oil reached 170 degrees, carefully slide in the potatoes and cook for 6-8 minutes, or until potatoes are cooked through and golden. Drain on kitchen paper. Meanwhile blanch the green beans in a pot of salted boiling water for 2 minutes. Remove the beans with tongs and set aside. In the same pot of boiling water, cook the eggs for 8 minutes, or until cooked to your liking. Remove the eggs and place into a bowl of chilled water, peel and slice. To serve, place the cabbage, tomatoes, cucumber, bean sprouts, green beans, eggs and fried potatoes onto a large serving platter. 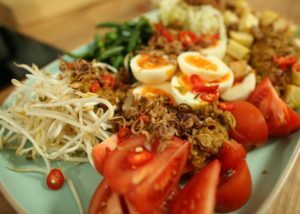 Pour over the satay dressing and garnish with Asian fried shallots and extra sliced red chili.